The 2019 Federal Minimum Wage is $7.25 per hour. The federal minimum wage is the minimum hourly wage an employee in the United States can be paid for their services. The federal minimum wage is set by a congressional act, has been $7.25 per hour since July 2009. Prior to the last 2009 minimum wage raise, the federal minimum wage was $6.55. As recently as 2007, the federal minimum wage was $5.15 per hour. 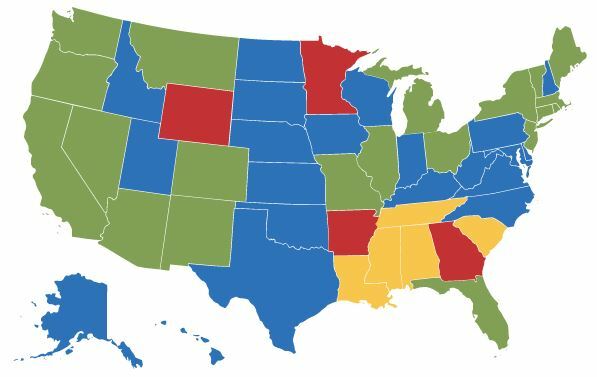 Fourty-five of the fifty states also have their own, state-specific minimum wage rates. Federal law handles state minimum wages by declaring that the higher of the state minimum wage or the federal minimum wage is to be used as the effective minimum wage. Therefore, employees who work in a state with a minimum wage higher than $7.25 are entitled to receive the higher state minimum wage. Employees who live in a state with no minimum wage laws, or an outdated minimum wage that's lower then the federal minimum wage, are entitled to receive the $7.25 federal minimum wage rate. When will the Federal Minimum Wage go up? While many states have a minimum wage rate that is automatically adjusted every year for inflation, the federal minimum wage is only raised when congress explicitly passes a bill to raise the minimum wage. The last time such a bill was passed was the Fair Minimum Wage Act of 2007, which raised the minimum wage from $5.55 per hour to $7.25 per hour in three increments. Recently, President Barack Obama has called for the federal minimum wage to be raised to $9.00 per hour and indexed to inflation in order to keep up with rising costs of living. While the Presiden's announcement has rekindled the debate over whether to raise the minimum wage, no bill actually raise the minimum wage has yet been introduced into Congress. Raising the minimum wage is a politically polarizing issue - Democrats generally support raising the minimum wage as a way to help raise the working poor out of poverty and stimulate the economy, while Republicans claim that raising the minimum wage hurts small business' bottom lines and has a negative affect on the economy. Because of the current political climate, it remains to be seen whether the Minimum Wage will successfully be raised in the near future. Who is exempt from the Federal Minimum Wage? The Fair Labor Standards Act includes a variety of exemptions to the Federal Minimum Wage and other labor laws, like overtime pay. Tipped Employees - Employees who receive at least $30 or more per month in tips, like waitresses or delivery drivers, can be paid as little as $2.13 per hour in cash as long as tis bring their total earnings to $7.25 in any given hour. Seasonal workers - Employees at certain seasonal establishments, like summer camps or water parks, are exempt from both minimum wage and overtime laws. Students - Some employers, with a special certificate, are allowed to pay full time students as little as 85% of the minimum wage under the FLSA's "Full-Time Student Program". An additional program, the "Student-Learner Program", allows vocationsl students age 16 and older to be hired for as little as 75% of the minimum wage (the employer must also have a special certificate). Both of these minimum wage exemptions are meant to allow businesses to hire inexperienced workers at a reduced minimum wage, while providing an "educational experience" for the student employees. Minors - The "Youth Minimum Wage Program" allows employers to pay a special "training minimum wage" of $4.25 per hour to new employees under the age of 20 for their first 90 days of employment. Once 90 days pass, or the employee turns 20, they must be paid the normal minimum wage. Disabled employees - Employees with a physical or mental disability may be paid less then the minimum wage if their employer applies for a special permit from the Department of Labor. This exemption is designed to help disabled employees get jobs. All employers are required by the Fair Labor Standards Act to post an up-to-date minimum wage poster in a conspicuous location in the workplace. Other posters are also required by the FLSA, and many states require a state minimum wage poster to be displayed as well. 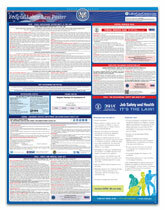 This professional federal labor law poster includes all of the posters needed to satisfy both Federal minimum wage, FLSA and labor law regulations. This poster has been updated for 2019, including the recent FMLA poster update. Professionally printed and laminated. Free federal minimum wage posters: You can download a free printable copy of the latest Federal Minimum Wage Poster below. Remember, posters are required for full compliance with state and federal laws. If you have any questions about the minimum wage or overtime law, you can contact the Department of Labor's Wage and Hour division. They will be able to answer your questions, and can help you if your employer has illegally failed to pay you the minimum wage or correct overtime pay. If you need to contact your state's Department of Labor instead, you can find their address and phone number on your state's state minimum wage page. The Department of Labor's hours are Monday-Friday 8 a.m. to 8 p.m. Eastern Time.